"PINSCORE Display System Williams 6A/7/9" has been added to your cart. Brilliant design makes brilliant displays. 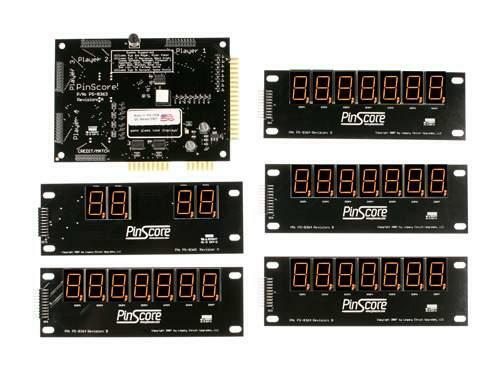 New PINSCORE LED displays for pinball machines are the best performing, most feature-packed and economical replacement systems for obsolete glass plasma digital displays. *CAUTION: These games were produced with two different connector systems. The master display controller board may have a circuit board edge connector or header pin connections. The header pin connector style is PINSCORE model PS-10749-P (see related items tab below). You may use your existing ribbon cables with this PINSCORE system or purchase fresh ones listed below. 1. CAUTION: This PS-8363-P Display System CANNOT be used with any original display or driver boards. Damage to both new and old boards will occur if the systems are mixed. Please remove all original boards and install only these new boards. 2. Unplug the AC power from your pinball machine. Remove game backglass. Unscrew and remove all original glass displays, master driver board and all inter-board connecting cables. 3. Mount all new boards in their respective locations and only hand tighten the mounting screws. You may slide the LED display boards horizontally to adjust their positions for alignment with your backglass windows. If not already in place, place the foam light shields on their respective LED display boards. 4. Connect the cables. Observe correct polarity on all ribbon cables - the red striped wires on all ribbon cables go to PIN #1 on all boards. 5. Double-check all connections, plug in the machine, and turn the game on. The LED’s will light up. Pressing the DIAGNOSTIC pushbutton on the Master Driver board will illuminate all segments of all displays. This indicates that all boards and cables in the PINSCORE System are operating correctly. Use the thumbwheel BRIGHTNESS control on the Master Driver board to set your preferred illumination level. 6. PLAY PINBALL! You’ll enjoy your PINSCORE Displays for years to come! This looks better than the other LED replacements I've seen. I got the displays today. The installation went off with out a hitch. The displays are great you can tell them from the original ones. They have the same orange light. This display looks very nice.